China’s westernmost city, Kashgar lies at the edge of the Taklamakan Desert, closer to Bagdad than Beijing. For travellers and traders coming from Central Asia and Pakistan, the city offers a first glimpse of China. Yet, in most cases, Kashgar strikes them for its similarities to the countries they have just left. Coming from inner China, on the other hand, Kashgar often leaves the impression of entering another country, particularly as one walks through the narrow alleys of the old town, or watches the crowd at the dusty livestock market on a Sunday morning. Kashgar’s old town, not long ago, was used as a set for the movie The Kite Runner, based on Khaled Hosseini’s homonymous novel, to represent Kabul prior to the Soviet invasion. Today, asked about the movie as they drink cups of milk tea in one of the few Pakistani restaurants in town, Afghan traders admit that the city somewhat reminds them of the Kabul of their youth. Kashgar’s links to the Central Asian world – geographic and cultural – are thus not only a feature of its much-discussed “old town,” which at any rate is being transformed in a massive process of renovation. Central Asia is also an important part of the city’s future plans for development. This future, far from the artisans and mosques of the old town, is reflected in the current construction of the new Special Economic District. The district will represent the core of Kashgar’s Special Economic Zone (SEZ), as the city was classified in May 2010. Kashgar’s model is Shenzhen, transformed in thirty years from a small fishing village into a large city that is one of China’s wealthiest. If Shenzhen was chosen for its proximity to Hong Kong, Kashgar lies within a day’s ride of four different countries: Kyrgyzstan, Tajikistan, Afghanistan (though the border at the Wakhjir Pass is not an official border crossing point and it is not served by a road) and Pakistan. China is not hiding these ambitious plans for its westernmost city. Quite the contrary. Between the end of June and the beginning of July, as foreign journalists in China were busy covering the most recent spate of attacks in Xinjiang, an important four-day fair in Kashgar went almost unnoticed. It was the ninth edition of the Kashgar Central & South Asia Commodity Fair, an important attraction for Central and South Asian traders. The main avenue was the impressive Kashgar International Convention and Exhibition Center, situated not far from the recently constructed Eastern Lake – a major attraction for Chinese tourists. Meanwhile, for the first time in 2013 the China Kashgar-Guangzhou Commodity Fair has been held as part of the main fair, though in a different location: the Guangzhou New City, a exposition complex in the South-Western part of town, on the Karakoram Highway, newly opened for the occasion. One of the main sections in the International Convention and Exhibition Center was dedicated to the new Special Economic District, the core of Kashgar’s SEZ. Here posters and brochures showed the modern look of the new Kashgar, while young hostesses explained the project while pointing at the impressive plastic model of the two “Development Twin Towers.” They say the two towers should be completed in three years, and with their 280 meters they will be the highest in Xinjiang. One of them will host the Kashgar Hilton Hotel, while the other will provide space for “high-end” offices. Next to this display, I was shown the model of a four-floor tax-free shopping mall, expected to open by the end of the year with brands such as Prada, Valentino and Louis Vuitton. On the walls, maps and posters showed Kashgar’s favorable location in Eurasia, underlying its proximity to the various capitals of the Central Asian “stans,” as well as Kabul, Islamabad and Delhi. 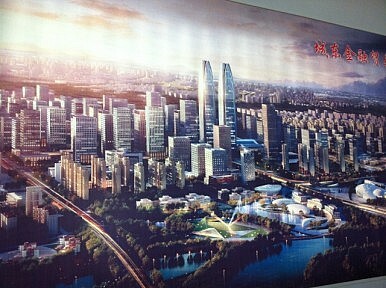 A few days after the fair I tried to visit the area where the new Special Economic District will be located. To get there, I had to cross Century Avenue, running down from the train station, and the railway itself. Contrary to what I was expecting, I found myself in the middle of the countryside. I first followed an old, narrow road, flanked by two lines of poplar trees and a water channel. Such roads are a quite common sight in Xinjiang’s numerous oases, but in this case I was expecting a busy construction site. After a while, I found what I was looking for in the form of a road of another kind: a modern six-lane highway, cutting straight through the fields. Han Chinese workers were asphalting it, while Uyghur kids rode their bikes and played on the unpaved sections. Following this road, I eventually found myself on the edge of a small lake, which I realize was just the northern section of the much bigger and partially artificial lake that will lie beside the two Development Twin Towers. As I continued my exploration, I noticed that the busiest site was further south, where a few buildings were already completed and others looked nearly finished. From a distance, I compared this dusty image with the posters and plastic model I have seen at the fair. I tried to picture the finished project in my mind, with neon lights, fountains and shopping malls, but on the hot and dusty construction site my imagination failed me. One of the workers told me that I was not allowed to go closer: “for your own safety.” I thus turned back toward the city center, stopping at a small restaurant along the way to eat some noodles in the shade of a veranda covered with grape leaves. Most of the Pakistani delegation comprised occasional traders. They visit Xinjiang only twice each year, for the Central and South Asia Commodity Fair in Kashgar and for the bigger China-Eurasia Expo in Urumqi. Most are from Gilgit-Baltistan, a region in the north of Pakistan where tourism has been hard hit since 9/11, forcing them to seek out new business opportunities. China is, by far, the main game, and Kashgar represents for them the gateway to its growing market. And Kashgar seems ready to fulfill its role as a major hub between China, Central and South Asia. The fair itself represents an important investment in this direction. Many Pakistani traders, for instance, had all their expenses covered for the four days of the fair: from the expositive space, to the travel expenses, to the custom duties and hotel. They were put up at the new Chini Bagh Hotel, another symbol of Kashgar’s enchantment with its future and detachment from its past. The newly opened four‐star facility, in fact, hides a historical building: the old Chini Bagh, former residence of the British consulate in Kashgar between 1890 and 1918. The building is unknown to most visitors, hidden behind crumbling sections of the hotel, and today houses a decrepit Chinese restaurant. An almost unreadable sign, in Mandarin, English and Uyghur, briefly illustrates the historical importance of the building, but barely anybody seems to pay attention to it, and most locals are unaware it even exists. During my first visit to Kashgar, in 2009, I was able to visit the chambers on the second floor, and even enjoy a view of the old town from the roof of the little tower. Today, that’s no longer possible, and this important section of Kashgar’s past is all but lost. With the city’s focus on the future, it’s a loss that will pass largely unremarked. Alessandro Rippa is a Ph.D. student in Social Anthropology at the University of Aberdeen. He recently concluded a year of ethnographic research on the Karakoram Highway between Xinjiang and Pakistan. You can follow Alessandro on Twitter @AlessandroRippa. As it seeks to reduce its dependence on coal, Beijing’s return to the Silk Road raises some unfamiliar security concerns.